Although there are several methods to select and extract portions of images in Photoshop Elements, the new Compose feature enables you to more easily extract one image and composite it into another. Open two photos in the Photo Bin. 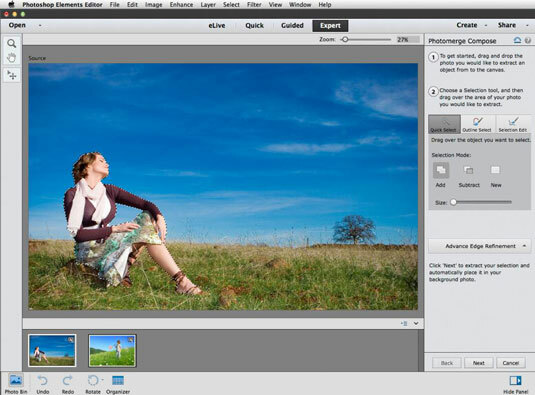 In any of the edit modes, choose Enhance→Photomerge→Photomerge Compose. 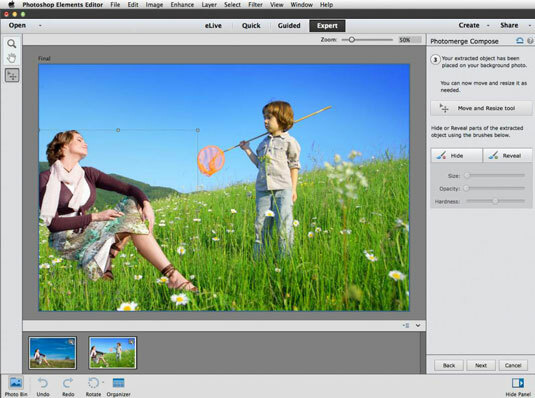 From the Photo Bin, drag the image from which you want to extract an element onto the canvas. Quick Select: Brush over to select your desired element. This tool works exactly like the regular Quick Select tool. Choose your selection mode — a new selection or add or subtract from an existing selection. You can also adjust the size of the diameter of your brush. Outline Select: Trace around your desired element. After your initial trace, release your mouse. A red overlay appears over the unselected areas. Add or subtract from the red overlay, and then adjust the size of the diameter of your brush as needed. Further refine your selection using the Selection Edit tool. Snap: Use the slider to adjust your snap strength from 0 to 100%. Snap is the intensity of the pull. Push: Place your cursor inside the selection to increase your selection within the diameter of the outer circle of your cursor. It will snap to the edge of the element closest to the cursor. Place your cursor outside the selection to decrease your selection within the diameter of the outer circle. Smooth: If your selection border looks a little too jagged, use this option to smooth your selection edge. You can choose to set the background — in other words, the unselected portion of your current image — to Source Image (which leaves your image as is) or have it fill with transparency, black, white, or a red overlay. You can also access the Refine Edge feature. Your extracted image is composited into your second image. Move and size your image as desired. You can further refine your selection by using the Hide and Reveal tools to either add to, or delete from, your selection. You can adjust the size, opacity, and hardness of your brush to better fine-tune your extracted element.